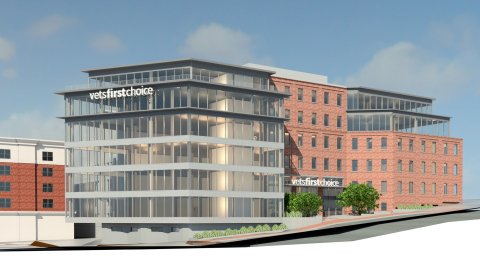 PORTLAND, Maine--(BUSINESS WIRE)--Vets First Choice has received city approval to commence construction of a new headquarters in Portland, Maine to support its rapid growth and expansion. The new approximately 170,000 square foot facility will support more than 1,500 employees, including a state-of-the-art pharmacy facility, enhanced software and data science labs, and office space. “We’re thrilled to announce this major expansion in Portland, Maine to support rapid growth, a new IT R&D effort and improved service to our northeast customers. 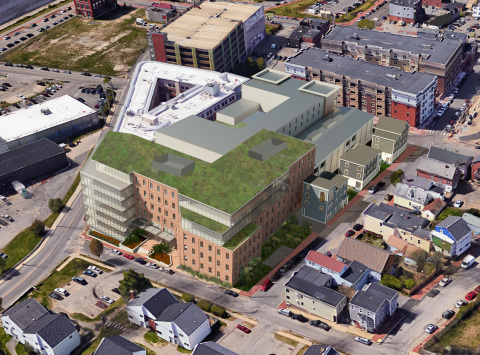 We expect to add more than 1,000 new high-quality jobs in southern Maine and believe this downtown location will be critical towards attracting world class talent,” said Benjamin Shaw, co-founder and CEO of Vets First Choice. The project, located at 12 Mountfort Street in Portland, represents a major milestone for Vets First Choice as the company looks to establish an even larger presence in the region and accommodate the significant growth the company has experienced over the last few years. Vets First Choice anticipates that the facility will also serve as the corporate headquarters for the planned new company that will be created when Vets First Choice merges with Henry Schein Animal Health (HSAH) later this year or in early 2019. The planned new company, with approximately $3.6 billion in pro forma revenue in 2017 and more than 5,000 employees, will continue to operate out of the existing Vets First Choice and HSAH locations throughout the world. The project will create hundreds of new professional jobs for Maine residents in areas like software development and pharmacy. Vets First Choice will be collaborating with the University of New England College of Pharmacy for residency, training and development programs. Construction will begin immediately, and the facility will include a state-of-the-art specialty pharmacy; an automated commercial pharmacy and fulfillment center; a world-class science, technology, engineering and math center; and office space. A large part of this project will be funded by the Maine Technology Asset Fund 2.0 (MTAF 2.0) in partnership with the Maine Technology Institute (MTI). VFC was awarded a $9 million grant toward the cost of this project, which will be completed in two phases, with the pharmacy and fulfillment centers expected completion in October 2019. The remainder of the project is expected to be complete by April 2020. The project was facilitated by Bateman Partners with CBRE | The Boulos Company, which represented Vets First Choice. “Bateman Partners, LLC is honored to be a co-developer of this exciting mixed-use development. Our team includes David Lloyd of Archetype, the project Architect, and AlliedCook Construction, our contractor, as key participants in the process of creating this landmark development for the City of Portland,” said David Bateman, president of Bateman Partners, LLC. Vets First Choice is a leading provider of technology-enabled health care services for companion and equine veterinary practitioners. Founded in 2010, the company partners with veterinarians to create insight into gaps in patient care and offers professionalized pro-active prescription management to drive client engagement and improve compliance. Its services result in better prescription compliance, increased client engagement, and improved practice revenues and profitability. For more information, please visit www.vetsfirstchoice.com.